TOMAR'S KA-BAR KNIVES-Camping Hiking, Eating Utensil Kits. 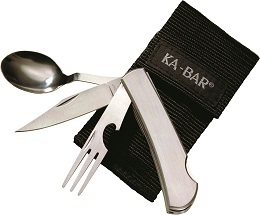 TOMAR'S KA-BAR KNIVES-Camping Hiking, Eating Utensil Kits. Weight: 0.35 Open length: 6 5/8"
Utensil Kit comes with a ballistic nylon belt sheath with Velcro closure flap. Knife, Fork, & Spoon All Separate For Individual Use. If Camping, Hiking, On The Road, Or In The Bush. A Very Handy Tool To Have ! Weight: 0.1 Overall length: 6.875"
Utensil Kit comes with an instruction manual for use.